But astronauts would beg — and even plead — to differ. Take a moment to ponder 25 of the most arresting images of Earth that humankind has ever captured from space. 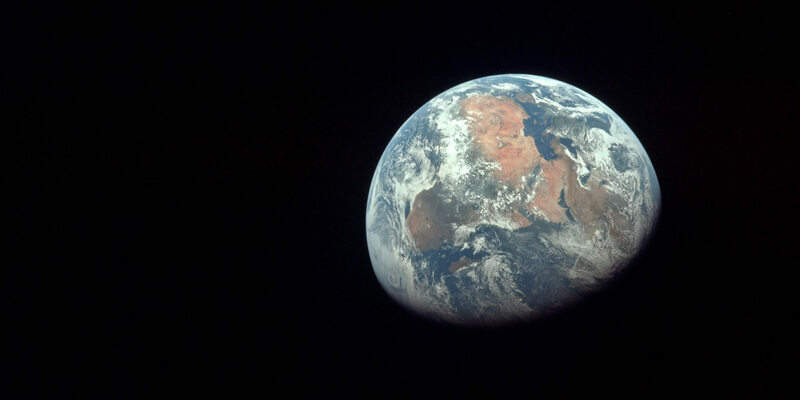 The crew of the last crewed lunar mission, Apollo 17, took this “blue marble” photo of Earth — one of the most-reproduced images in history, though no one is certain which astronaut took it — from 28,000 miles away on their trip to the moon. Africa is visible at the top left of the image, and Antarctica on the bottom. About twice per year, the moon passes between DSCOVR and Earth — and we get a rare look at the moon’s far side. This series of images was taken between 3:50 p.m. and 8:45 p.m. EDT. Launched by NASA in 2009, LRO normally stares down at the cratered surface of the moon — but took a moment to snap this modern-day “Earthrise” composite photo. A rare view of the far side of the moon, taken by the China National Space Administration’s lunar probe. China has grown increasingly capable of exploring the solar system alongside NASA, ESA, Russia, India, and other space-faring nations. Its next moon mission: to return a lunar soil sample in 2017. If it succeeds, it will be the first collected since the last Apollo missions in the 1970s. The astronauts Thomas Stafford, John Young, and Eugene Cernan took this video during Apollo 10, the second crewed mission to the moon — essentially a dry run for Apollo 11 (without the landing). Because the same side of the moon always faces our planet, such “Earthrise” views only happen when a spacecraft is moving. Most photos of Earth and the moon are (artful) cut-and-paste composites, since they are so far away from one another. However, this is the first photo of both worlds ever taken in a single frame, when Voyager 1 was 7.25 million miles away — en route to its “grand tour” of the solar system. NASA’s Juno spacecraft took this shot (and many others, which were made into a fantastic animation) during its nearly 5-year-long trip to Jupiter. The probe is documenting the gas giant in ways scientists had previously only dreamed of — including the first-ever images of the planet’s poles. When the mission wraps up in a year or two, NASA will plunge Juno into the clouds of Jupiter to prevent contaminating nearby icy moons. About two months after a textbook landing on Mars, the Spirit rover gazed up at the sky to look for Earth — and found it as a tiny dot. NASA says this “is the first image ever taken of Earth from the surface of a planet beyond the Moon.” In this shot, Earth is roughly 161 million miles away. Billions of miles from Earth, as Carl Sagan famously quipped, our world is just a “pale blue dot,” a small and solitary orb where all of our triumphs and tragedies play out. This photo of Earth — the “pale blue dot” — is just one frame of a “solar system portrait” that Voyager 1 took, roughly 4 billion miles away from home. Japan’s moon-orbiting Selenological and Engineering Explorer (SELENE) spacecraft, also known as Kaguya, took this video of Earth rising above the moon — sped up 1,000% — on the 40th anniversary of NASA’s Apollo 8 “Earthrise” photo.